One day, I woke up, I made myself a coffee, and right then and there, I decided it was over between sugar and me. At the time, I didn’t know this decision was going to change my life completely. I just remembered something I’d read somewhere that said getting over sugar only takes three days. Three days. Easy. Three days, and I’d see how it went. It was the month of September. I’d had house guests all summer, and of course, I’d totally let myself go. I’ve always had a tendency to do that – forget about my body. Live in my head. I’d been eating, drinking and even smoking cigarettes, I hadn’t been exercising, I wasn’t taking care of myself. I was having a great time taking care of others instead. But then they were gone, and I was exhausted. I wasn’t sleeping well, I felt swollen, I felt dull, I hurt all over. I didn’t feel well. So, I quit sugar right then. With no guide, no book, no idea of what sugar really was, even. Just a thought, a feeling, and my intuition. I could tell my body was reacting to sugar more and more. Whenever I ate something very sweet like a cookie, a lot of times my heart would race, and I felt something weird, but indescribable. It was only after I made the decision that I started to do a little research. Read a little bit about it every day. I watched a few documentaries. I started to understand how sugar functioned in my body. And I started to understand that certain things I thought were totally normal, things I basically considered personality traits, were actually symptoms. And that came as a shock. I’m not going to try to explain it all here, because I’m not a doctor and it’s long and tedious. But just to give you an idea, here are some of the symptoms. And here’s how I used to explain them to myself. My muscles always felt tense, especially around my neck and shoulders. It was painful sometimes, and incredibly bothersome, as if someone were trying to strangle me. What I told myself: stress, I needed to get rid of stress in my life. My anxiety attacks were coming back more and more often. They weren’t very intense, but they were happening closer and closer together. What I told myself: It’s psychological, something’s wrong with you, you have emotional problems. I had totally irresistible food cravings. Sometimes I’d find myself eating chocolate without even thinking about it. Almost like I was sleep walking – it was completely unconscious. I was often totally overcome with fatigue. Everyone around me was aware of it. At the Atelier, for example, my team knew if a meeting went on too long and I didn’t have anything to snack on, I’d stop functioning entirely. Sometimes I’d have to lie down while I was waiting for my Seamless delivery to arrive. What I told myself: It’s not a big deal. That’s just me, it’s the way I am. And I HAD to have something sweet after every meal. If I didn’t have my square of chocolate, things were not okay. I was still hungry. And a lot of times, I’d feel intensely hungry right after a meal. What I told myself: This, I didn’t understand at all. I was sleeping terribly. I would often wake up around 5:00 in the morning, my mind fully alert, and I couldn’t get back to sleep. What I told myself: I’ve always been a light sleeper in the morning. That’s just me, it’s the way I am. I was going to the bathroom a million times a day. What I told myself: That was actually starting to worry me. I’d been dealing with all of that forever. Some symptoms stood out, like my heart racing after I ate sugar. But that’s all. And for someone who wasn’t used to listening to my body, none of it seemed like a big deal. And when I talked about it with people, the response was often: oh, don’t worry about it! You’re just stressed and tired. The first day was super easy, of course. I’d decided to take it very seriously all three days: no simple sugars, no complex sugars, no fruit, and no coffee, since, like sugar, it can cause insulin spikes. And no alcohol, of course – it’s sugar! Ouch. The second day was when it all started. First, my mood. Horrible. I felt like yelling at everyone. Fortunately, I was able to laugh about it too, a little bit. I knew quitting sugar wasn’t going to be easy. I felt exhausted, my hands were clammy and a little shaky. I couldn’t believe it. I was like a real addict going through withdrawals. It went on like that for several days. A lot more than three days, in fact. But with everything that was happening in my body, I definitely wanted to continue the experiment. The days and weeks that followed were difficult, but exciting at the same time. I was sleeping horribly, even worse than before. I had monstrous sugar cravings, but I resisted them with all my strength, and there were times I felt like I was dying of hunger – even right after I’d eaten a perfectly balanced meal. During that time, I continued doing research. I read everything I could, watched all the documentaries possible. I’m still doing that now. It’s even become a bit of an obsession, but I figure that’s normal when you’re going through a life change like this. I learned that almost everything I described above was caused by sugar. No, I wasn’t crazy. I even started to realize some unbelievable things about the effects of sugar on our brains, our emotions, our beauty and our willpower. And, on fertility. The more I learned, the more shocked I was. Especially since new things started happening. I started sleeping better, but my muscles were tenser than ever. I could barely even move my neck. My energy started to be a lot better and lasted all day long, instead of going from super stressed to exhausted every couple of hours. My body was getting used to not having sugar, but was also resisting at the same time, sending me insane cravings. I stayed strong and didn’t give in to my sugar cravings, feeding myself with proteins, healthy fats, of course, and lots of vegetables…and probably a little too much almonds. Little by little, my muscular tension started to dissipate. I wasn’t having blood sugar crashes anymore. I could go entire hours without eating without collapsing from exhaustion. I was able to tell the difference between real hunger and a lack of sugar. I stopped having anxiety attacks. My constant trips to the bathroom calmed down. And I lost weight – or rather, I wasn’t puffy anymore. People said I looked great. It was so good, but at the same time, it was horrible. How had I been living under the control of sugar for so long without even knowing it? On the other hand, now that I know, it all seems obvious to me. In my family, there’s been a lot of type 2 diabetes. And now, three months later, I think I can say I was probably on track to develop diabetes myself. I had gotten my blood drawn a few months prior and my sugar levels were normal, according to my doctor. But when I did my own research, I finally learned those tests often don’t detect the problem until it’s already too late. Before that point, you have to look for the signs, open your eyes, and listen to yourself. Having a little bit of a sweet tooth. Needing to go to the bathroom frequently. Your heart pounding after you eat sugar. Feeling extremely hungry right after eating. Gaining weight around the stomach area, which again, I justified as being a family trait. But what do we really inherit? Is it our body type…or our lifestyle? I had never questioned the way I was eating. We eat well in my house – Mediterranean style. We cook, we go to the market, we make salads, soups, grilled fish. It’s healthy and fresh. But we also love bread. Jam. Wine. Desserts. Chocolate. We don’t even think about it…those things are just part of everyday life, right? But she wasn’t the only one. I wrote a post about it here, where I made fun of myself without going into detail about my diet, and I immediately received super harsh criticism. I thought a lot about these reactions and about what they meant. I understand the stigma attached to food and restrictions, especially coming from someone who also talks about fashion. But I also knew nothing could change my mind. I felt so much better. What that taught me was not just that harsh comments are still painful, even after eleven years of sharing my life online… What I learned most of all was that rejecting your own culture is a very hard thing for your tribe to accept, whether real or virtual. Sugar isn’t just something we eat. It’s a whole culture. It signifies happiness, family, celebrations. Bread is a symbol of sharing. Detaching yourself from all of that is, in part, rejecting your family culture. Or your culture itself. It’s hard, but it’s also incredibly liberating, emotionally. Finding your own way of eating is kind of the same as finding yourself. Of course, there were tons of wonderful voices that stood out above the criticism. One person told me quite simply: “I see this new chapter as a big gift you’re giving to your body.” Those words stuck with me and they keep me going every day. It’s really not easy quitting sugar. There’s sugar everywhere. And besides, the idea isn’t to become paranoid about it. Just, aware. The hardest part was changing my breakfast. Since I was addicted to toast, switching to eggs was really depressing for the first few days. Especially because I’d also quit coffee. Since the only thing I wanted every morning was my coffee, my bread and my butter, I felt like I was being punished. But very soon, I started feeling the incredible benefits of eating protein in the morning. I could make it until lunch with no problem, without feeling hungry. I didn’t even think about eating anymore, actually. I started making myself nice little bowls with avocado and salmon, and I started to enjoy them. The other test was not having something sweet after my meals anymore, a persistent habit I’d had for years. I always carried dark chocolate with me – that’s how afraid I was of going without it. Yes, you heard me right. That’s how addicted I was : I needed to have sugar with me all the time. I justified it by telling myself dark chocolate was good for your health. But really, it was just another way to get my dose of sugar. So, no more dark chocolate, and nothing sweet after meals. It was hard psychologically, and even harder physically. I would finish a big meal and feel like I was starving. I’d feel nervous and find myself in the kitchen without knowing why. The answer: my body was looking for sugar. That part was incredibly hard. And I still get that feeling sometimes. And of course, no more bread, no more cookies, no more treats. And almost no more grains – very little. I didn’t want to go looking for substitutes for sugar, not right away at least. There are tons of blogs that offer things like that – how to make cookies without sugar, for example, but I wasn’t too interested. I wanted to break my attachment to sugar and my attachment to the sweet taste. It was important for me to make it a real breakup – crystal clear. Slowly, I started to reintroduce small amounts of fruit and alcohol. And I found a recipe for bread made from almond flour that is delicious and doesn’t raise my blood sugar. Little by little, I kind of lost my passion for breakfast. As someone who used to wake up totally famished (which I now know was just a sugar withdrawal), breakfast was now kind of annoying to me, and I wasn’t even finishing my food. I decided to listen to my body and only eat when I really felt hungry. I reintroduced coffee as well, because without coffee, my life (and okay, let’s be honest, my digestion) was just not as happy. I drink Bulletproof coffee now, which is delicious and works really well for me. I barely eat in the mornings anymore – only if I’m hungry. It’s as though all the rules I’d been taught my whole life (you have to eat the breakfast of a king!) were melting right in front of me. And besides, I always told myself: if I really want to, I’ll eat a cookie – a real, delicious, wonderful cookie from Gjusta. And that’s it. But I never really wanted to, so for the last three months, I never faltered. I was doing so well that even the idea of a cookie didn’t sound good to me. Crazy. And it was like that up until Thanksgiving. For Thanksgiving, I decided I wouldn’t be a health nut. I had just come back from Morocco, where I’d managed to eat rather well, and I was exhausted, and I was with Chris’ family, and they eat healthy and are excellent cooks. I ate a little bread, pasta, and potatoes, depending on the meal. I didn’t love how it made me feel. Some of my tension and joint pain came back right away, but it was totally manageable and I was super happy to share those moments. The last day, we all decided to go out for breakfast at a restaurant in town. I had to go straight to the airport afterward, and drive two hours alone with Lulu by my side. I was so into the ambiance that when the kitchen sent out a huge American-style cake filled with cream, white flour and refined sugar, I told myself, hey, I’m going home tomorrow, I’ll get back into my routine. It’s fine, I’ll have a piece of cake. At first, of course, it tasted incredibly sweet, like a sugar bomb in my mouth, which I expected. It was sweet and creamy, but to me, it had no flavor. It was all overpowered by the pang of sugar. And right away, I started to not feel well. Suddenly, I couldn’t feel my body anymore. Like if I had smoked a joint. I started to feel completely paranoid (which is why I don’t smoke joints). I couldn’t talk, I felt like I was turning red, like everyone was watching me and thinking I was weird and crazy. It was like I’d taken a super strong stimulant, I felt a sudden physical and emotional tension that made me feel super uncomfortable. It was like I was super drunk, and I lost all sense of orientation. I got up to get some air, and it felt like I was in a cloud, the ground was soft, everything was fuzzy. My brain couldn’t think anymore, but I needed to say goodbye to my beloved family and Chris, and I needed to drive. And since I was feeling so paranoid, I couldn’t really say I was in no condition to drive. I didn’t even believe it, myself. I’d just eaten a LITTLE PIECE OF CAKE (OK, I’d also had coffee and eaten potatoes), it’s not like I’d just shot up heroin, jeez!!! I gave everyone hugs haphazardly because I was seeing double, and I went to sit down in the car, in what was probably one of the worst “bad trips” of my life. It took me fifteen minutes to find Google Maps on my phone. I tried putting on a podcast to calm down, but I couldn’t find it. I started driving because honestly, I wasn’t clear-headed enough to tell myself to take ten minutes, drink a glass of water, breathe, tell Chris I was really not okay and not leave like this. I got completely lost, of course, and I could have had twelve accidents. I finally found the highway, I got on it and prayed I would arrive at the airport in one piece. I told myself I would feel fine in half an hour. But it took me an hour and a half to come back to earth. I drove, terrorized, paranoid, anxious, and tense for a whole hour. I don’t want to make any big declarations or jump to conclusions. A lot of people are able to live perfectly well eating reasonable amounts of sugar. I just think that for me, I had gone over my sugar limit for way too long. And my body can’t handle refined sugar at all anymore. That’s it. That’s my experience, my journey, my story. It may inspire you or irritate you, but it won’t change anything about what I know now: we have to listen to our bodies and when we do, they tell us absolutely everything. What is good for us, what isn’t good for us. In what quantity. At what time. There are no absolute rules or ultimate guides, there’s no perfect diet. And I’ll never stop learning – I know that now and I find it completely fascinating. Discovering your own ecosystem is a journey of a lifetime. As you told me yourselves, it’s the most beautiful gift you can give your body, and yourself. I can’t imagine giving up sugar… but maybe I will try as my new years resolution!! Tout est beau, tout donne envie dans ces photos : les fringues, les cadres, l’espace, le studio, la lumière, bref j’adore ! C’est un site où l’on sent l’inspiration et la création. Thank you for sharing your perspective on cutting sugar. I have experienced similar things in terms of the cultural meaning of food – people feel offended and question your reasoning. It’s curious, really, how deeply what you fuel your body with is related to culture. However, and I think people are slowly recognizing that, you really are what you eat and fueling your organism with low-quality and energetically unsustainable meals is not a promising option in the long run. Having become more aware of the negative consequences of eating sugar recently, I was especially shocked to find different types of sugars as additives in countless supermarket products. The best solution in terms of health really is to not use processed foods and prepare as many meals at home as possible. Je me retrouve complètement dans la description que tu fais de ta crise d’angoisse post part de gâteau. Je ressens exactement ce que tu décris quand je fais moi-même une crise d’angoisse. Et je n’avais jamais fait le lien jusqu’à présent avec le sucre. Une piste intéressante à creuser du coup pour voir si réduire le sucre pourrait contribuer à réduire mon anxiété. Merci beaucoup pour cet article. I agree that everyone’s body is different — getting to know ourselves both physically and mentally is a lifelong process. So now you must apply your Thanksgiving lessons to Christmas and New Year’s — always a challenging time when it comes to maintaining a healthy lifestyle. I love your drawings and your diary pages, they are always worth the wait. Because I am a similar age and am experiencing similar changes in how my body reacts to food, I wonder how much of this is our bodies as they are changing. To some extent they seem to be more sensitive, but also wiser. I have struggled with my weight the last few years, and only gradually gradually gradually do I find myself eating a little less, needing less, wanting less. And sugar falls into that – I find that I don’t want it very much. (Cheese is another story, but even that, smaller pieces are enough.) And my body is happy, and I feel calmer. For me, going without coffee is more important – like any stimulant, my response to it is so strong, it leaves me very smart and alert (yes! ), but also jittery, anxious, and less mindful and attentive moment to moment (noooooo). It’s such a joy to learn better to listen to our bodies and what they say. It’s good to hear your journey – thank you for sharing with us, and I’m so glad you are feeling good! I don’t agree with missing a breakfast as you need to raise your blood sugar after sleeping and get your body going for the day.Also if you eat small amounts of protein and don’t let your body miss any food for a maximum of 4/5 hours that really helps to stabilise your blood sugar levels.Eating rye bread and sour dough breads are also metabolised more slowly in the body.There’s loads of good info out there on the internet,dieticians,books etc so you have to work out as you said how they make your body feel the best.I would also suggest that a lot of travelling will also really unsettle the body.Thats what I have found as I get older so I need good regular sleep in my bed,eating well and regularly and breathing good clean air whilst getting good regular exercise which I enjoy. I understand that giving up sugar is an accomplishment that you’re proud of, but isn’t there anything else going on in the world that you’d rather talk about right now? Am I the only one who is sick of hearing about this topic? We get it! Maybe next time something a little more meaningful? I generally visit nytimes, cnn, huffpo, bbc, etc… for other topics. Plenty of ‘meaning’ going on there. I come to this blog to escape that and enjoy reading these types of posts here because it’s a fashion/lifestyle blog and I can relate to this post and most of the other content. The internet is vast, my friend. I believe there are a lot of important things going on in the world, but our body and well-being is not less important, and sharing our private experiences within a large group of people requires courage and empathy, let’s be good to each other ? Hey Mara, I know what you mean. I dont think it is a question of “what”, but rather “how”. I miss the step from the personal to the ecological, economical, social, political, the sight of the bigger picture. In case of sugar it could be the industrialization both of agriculture and food processing (preceded by colonialism), increasing specialization and therefore increasing dependence and decreasing transparency in all parts of life with concurrently fear lit by specialists. Why not put fashion, wellbeing and politics in one like I mentioned a few days ago on the issue of racism? Different sources, for different types of interests and media. As you must know, this space is a lifestyle blog. This sharing of experience and information is true to Atelier Dore. Your criticism is thoughtless and brutal. Oh Brizz. I wanted to die of boredom reading your comment, sorry. I come to this blog for the personal and beautiful.. not the things you suggest, which are drearily available everywhere else if you care to look. It’s like going to the florist and complaining that they don’t sell toilet brushes. Pointless! Bonjour Garance – très inspirant ton histoire. Dis-moi, peux-tu partager avec nous quelques lectures sur le sujet (celles que tu as préférées) et les meilleurs Healthy Podcast ? Merci! J’aimerais beaucoup avoir cette liste de podcast également! Et merci pour cet article, ton histoire vraiment inspirante et intéressante, j’ai hâte d’en savoir encore plus. I get so excited when I see that you have shared a new post and I love this whole story!! I have struggled with sugar in a similar way, it has always been my biggest vice. Since giving it up I feel much better, but still face temptation from time to time. I am astonished at my mood swings and physical reaction when I surrender to eating some. It is a drug with very strong claws. I’m trying my hardest to raise my daughter with a healthy relationship to sugar, but sometimes it’s an uphill battle. Her teacher gives her jelly beans as rewards, her Grandmother loves to shower her with treats, her friends eat a lot more junk food than we do at home. The sugar culture is hard to hide from and I wish it was different. Thank you for being a health crusader and sharing your point of view on this controversial topic. Thanks for being brave and sharing your story, Garance! My husband dragged me, kicking and screaming, onto a gluten free diet after years of energy crashes, mood swings, and weight fluctuations. I hated, hated, hated it for about a month, then completely forgot about bread. A lifetime of these problems started to disappear. I totally thought it was just part of who I was, too! Now I can pass up cookies and breads like they’re not even food. Thank you for this, Garance. I’m going through something similar and now in my late forties. I haven’t cut sugar out entirely, but most sweet things literally burn my mouth now that I’m not accustomed to it anymore. One of my new diet interests is now herbal tea. I love that so much flavor from beautiful plants can come in the form of liquid that has no calories. Can you please share your favorite herbal teas? Allowing others to peek into your personal life is a double edged sword. And food is VERY personal. Most people are very brainwashed about what is “normal” and “acceptable” and “healthy”. Veganism for example, raises red flags for all kinds of otherwise nice folks. They can turn your normal and easy going friends into judge and jury against you in a moment. In the end, you need to know what works for you and stick to that. Did anyone who criticized you actually understand the side effects of sugar on your system? Probably not! Until you experience these symptoms yourself, you will not understand. Your body is always always always communicating to you – there is no safe base line if you are taking in any food/substance that is toxic to you specifically. For some that may be sugar, some caffeine, some gluten, etc etc…. Listen to your body and trust yourself to nourish yourself as your nature requires. Fads, diets, opinions be damned. Sugar is the devil is my motto, and it’s in practically everything so almost impossible to eradicate entirely. I cut sugar out about a year ago when I noticed that regardless of how hard I worked on my abs, middle age spread was setting up base camp there. Once the sugar was cut out the paunch disappeared! Wow Garance! This describes me perfectly. I gave up all refined sugar and breads years ago. But I have always said my desert island must was chocolate. It has become an addiction. Everyday and not just a square. I blamed the more frequent panic attacks and brain fog on stress. Ignored the fact that chocolate has become a constant in my life. I went off all forms of sugar and felt great but have somehow fallen back into old patterns. I have resolved to eliminate it again. Your story makes me realise I can do it too. This is my decison as to what’s best for me. No judgement on anyone else. It’s funny how defensive people get when you abstain from certain foods. I gave up alcohol and you wouldn’t believe the abuse I took for it. Alcohol messes me up for days. Yes one glass keeps me up all night and messes with my hormones. I refuse to give in to the pressure of others to just have one bite or one glass. Stay true to what makes you feel amazing. I will never critiscise anyone for what they eat. Why should they criticise us. And yes Diabetes 2 runs in my family. Not worth it for me. Thank you for this story which to me is very meaningful. I also realize how my body changes and my joints and neck often feel stuck and painful and I think listening to ones body is a great thing to learn for just anyone. As I’m not very creative foodwise, I would be very interested in the meals you came up with in order to let go of sugar or what you do while traveling. I often find healthy food is very difficult to maintain when not in my usual surroundings. Thank you! I was waiting for this post impatiently. Thank you for the motivation I’ve got reading it. I’m trying to minimize my sugar consumption since last summer. And it is so difficult. I’m trying to do it slowly and naturally, step by step. I feel it would be too hard for me to do as you did, to quit sugar at once. I was so addicted, I used to eat 100-200 g of chocolate per day regularly. And besides I had cookies, pies and sweet coffee occasionally. After almost half a year making efforts, now I manage to have two days per week without any sugar, I do not drink coffee at all and I ate 200 g chocolate last month. Still I can not resist a good pie. I think I’m not going to stop using natural sugar (fruits). I feel much better this way. I had the same totally irresistible food cravings as you wrote. Now they are gone. I do not have fatigue, or depression. Earlier it was like a closed circle, I needed a constant dose of sugar to keep my high spirit. I want to keep this way of living and even to improve it a little more. I would say that this is a way of life to stay in constant awareness with your body and mind. Thank you, Garance. Good luck on your journey. Wow! Thank you for sharing such an amazing journey. I am fascinated at how responsive our bodies are to positive changes, and how we can essentially renew our physical forms through healthy practices followed closely. This was written in the beautifully honest, vulnerable, strong, lovely way that you write all of your posts. Thank you! I especially appreciated this quote: “we have to listen to our bodies and when we do, they tell us absolutely everything.” C’est incroyable et magnifique, n’est-ce pas?. Merci encore, Garance! You are very eloquent in your description. We have been really good about not having sugar in the house. Refined sugar anyway. We have plenty of fruits (no juice), and we do drink wine. And eat pasta (and though my daughter and I love whole wheat pasta, husband will have nothing to do with it and will throw a tantrum). So we aren’t 100% pure. But no cookies or cakes or candy. Until this weekend, when we threw a party. Of course we served dessert. And there were leftovers. I just ate a large piece of cheesecake before reading this. I can attest to a similar reaction as yours to the relapse. Back on the wagon now, at least until Christmas. Incroyable de lire ce témoignage ! Je vis cette situation, je connais ces symptômes, cette dépendance et ce sevrage que j’ai dû mettre en place du jour au lendemain. Ces phrases me rappellent combien le sucre est nocif et transforme non seulement le physique (gonflement, rougeur) mais aussi le caractère. On passe par toutes les gammes d’excès émotionnelles. C’est comme une pollution atmosphérique mais à l’échelle du corps. J’encourage chacun et chacune à essayer. ça vaut le goût…pardon ! le coup. Comme vous le dites, c’est clairement identitaire, lié à l’éducation, à la culture. Bonne route sur ce chemin qui s’allège pour mieux s’enrichir et se diversifier. Merci du partage. Eh ben voilà! J’ai l’impression de retrouver la personne que j’avais appris à connaitre au travers de son blog: déterminée mais légère par rapport ses faiblesses, ce qui nous remplit de bienveillance à ton égard (et au nôtre aussi, par conséquent!). Et quand c’est comme ça, avec ou sans sucre, on prend! Moi aussi j’adore tes illustrations. Garance, thank you SO much for sharing your trajectory! I am in such a similar place, albeit in my mid-forties, resisting giving up gluten, dairy, and sugar, though my body has grown so sensitive to them. The idea of giving my body this beautiful gift, rather than thinking in terms of restrictions is incredibly helpful. I’m also astonished by the judgment people have when you say you’ve given up sugar. Wouldn’t everyone prefer to feel their best?! Bravo to you for listening to your body!! And would you mind sharing the almond bread recipe you’ve found? Would love to try it! Peut-être que de parler de “connasse healthy” était maladroit, ça avait l’air d’une mode, d’une lubie, pour gens privilégiés. Et qui préfèrent se priver de la compagnie des autres pour une question de mode. -et la question de l’addiction, du craving en anglais. Est-ce un pb moderne je ne sais pas. Café, cigarettes, alcools, drogues dures… et donc le sucre aussi. On en parle peu, on connaît moins. Est-ce que demain on considérera que c’est une substance addictive avec ses effets néfastes ? Peut-être. À part ça Que choisir essaie de faire passer au niveau européen une classification qui permettrait d’indiquer clairement et simplement la qualité nutritionnelle des produits. Ça peut être une bonne idée d’utiliser ton influence pour soutenir l’initiative. Qui peut avoir des effets importants pour les gens moins au fait de ces sujets, ceux qui vraiment ne s’écoutent pas du tout ! Ou qui n’ont culturellement pas idée qu’ils devraient écouter leur corps. When I quit smoking my smoking friends got VERY upset. People don’t like to be told they are doing something wrong. It’s human nature. Don’t take it personally. On another note you my want to get tested for SIBO (small intestinal bacterial overgrowth). It can cause severe sugar cravings and a host of other symptoms. Good for you Garance!! I commented some time again when you wrote about infertility and I shared my experience about adopting 2 children. And now I feel I must share another experience. Until recently I too struggled with food and didn’t realize it was a sugar issue. I was always hungry even after eating. In retrospect. I experienced fatigue after eating. I am now off sugar. No added sugars, no breads/pastas, no milk/yogurt, etc. I eat vegetables and small amounts of meat/fish/chicken. No more than one piece of fruit per day. Small amount of red wine. Sometimes cheese as a desert. This works for me. I’ve controlled my appetite and my energy levels. The reason all this works is simple — all these years I’ve suffered from undiagnosed PCOS. It explains the infertility and the food issues as well as other symptoms that are not relevant to discuss here. My advice — think about the big picture. You can successfully make changes that you need to live comfortably and well. Tellement d’accord avec toi sur ce qu’implique socialement ce type de decision et sur le tel bien être que cela implique physiquement. Me voilà depuis quelques temps face à ce problème vis à vis de mes 2 enfants, 8 et 4ans. …. Mission tellement difficile de les detoxifier, de limiter ( et non interdire…) le sucre sans les priver de vie sociale….je vois quels dégâts cela provoquent sur leur comportement… Je leur explique beaucoup les effets désastreux de la mal bouffe industrielle sur leur corps et sur la planète , ils comprennent mais avec le sucre l’histoire passe pas très bien …. Je substitue, je ruse, j’experimente mais au pays du pain au chocolat la tâche est rude….tellement il y a d’autres batailles aussi au quotidien :-). Oh I know this feeling of abandonment of your tribe all too well. I’m Ukrainian, so just as Garance said about her culture, we too love bread beyond anything. Pastries, heavy foods, lots of sourcream and lots of tea accompanied by candies and cookies all day long. So when I went raw-vegan, everyone I knew was thinking that I went nuts. I ditched everything my family believes in. I’m no longer doing raw, it wasn’t working for me. But I remain vegan and a healthy vegan, with exception of plant-based pizza from time to time. I wish you luck, Garance. Just try not to ditch fruits too much, they’re arguably the most important food there is for humans. And the sugar in fruits is not a processed one, it works differently. Oh I just loved this! And you have inspired me totally. We’re similar in age and how we live and I’ve been kidding myself for too long that I don’t eat sugar just dark chocolate…. except I polish off a HUGE amount of dark chocolate every single day. Je viens de faire l’expérience du « sans sucres « pour des raisons médicales , glycémie trop élevée . Tu as raison Garance le sucre n’est bon pour personne , et génère des tas de maladies . Bravo Garance! C’est un vrai sevrage que tu fais là sachant que le sucre agit comme la drogue sur notre cerveau! Vraiment bravo. En tant qu’étudiante en naturopathie j’ai enfin réalisé à quel point le sucre industriel et raffiné est nocif à tous les niveaux. Et ton témoignage est très frappant. Je ne validerais pas tout ce que tu manges à lire le témoignage mais je salue cette volonté que j’envie! Bonne continuation! Wow, your aches and pains sounds extremely familiar and though I think I eat healthy I might actually be consuming way to much sugar. This give me a lot to think about. Any books and blog reco would be really welcome! désolée, vraiment, je crois bien que j’avais laissé un de ces posts véhéments à propos du sucre..
Je croyais que tu ne lisais même plus les commentaires d’ailleurs, et que ton équipe les triait pour ne te laisser voir que les bons..
Donc voilà, toutes mes excuses. Maintenant je comprends mieux.. Et..moi aussi j’essaye de limiter les sucres raffinés et surtout les sucres cachés. NB tu savais qu’il y a du sucre de la Vache qui rit et même dans les légumes en boite? (enfin je crois). It’s wise to take better care of ourselves and each other especially in uncertain times. I too used to carry dark chocolate around with me – especially when traveling. Instead of sugar though, I sometimes crave salt – namely chips. I would say “no!” when I see them in passing only to regret not having purchased them hours later as I scavenge through the cupboards for a possible tiny stash of forgotten chips. Your strong reaction to reintroducing sugar to your system shows how familiar its power had on you. Your memories of what it felt like to function as a stressed out and exhausted ?sugar junkie would give anyone anxieties. With more time, the uneasiness in “let’s not go there again” will be replaced with acceptance and this great love and understanding of yourself. However, what puzzles me is that every diet I read about, since I could hold a magazine and read about fashion have suggested a meal consisting of protein and vegetables; Dukan and now Paleo, I wonder what would be the new name for it. I have to be suspicious whether the meat and food industry don’t impact in some “way” our notion of a healthy meal. It is not sustainable for all of us to eat that way as well, bearing in mind our location and availability of certain foods. There is a blood type factor we should maybe consider and you know, if you are hunting your animals, then by all means, live like a “Hunter and Gatherer”! In my experience, moderate amounts of complex carbohydrate like parboiled rice, wholemeal bread, barley, or millet, do balance my blood sugar, especially when eaten with beans, cruciferous vegetables or some green’s and a bit of nuts or seeds. Je lis souvent ton blog mais ne laisse jamais de commentaire (sur aucun blog d’ailleus) mais là ton témoignage m’a vraiment remué…..et oui, moi aussi je fais partie des personnes qui, sans prévenir, ont des palpitations, des sueurs, des peurs inexpliquées…..des crises d’angoisse quoi ! J’avoue que j’en ai marre d’etre Comme ça et d’avoir du mal à prévoir des choses ayant toujours peur de ne pas savoir comment cela va se passer. C’est vrai que j’ai remarqué que quand je mangeais trop, je n’etais pas bien mais c’est vrai qu’en y regardant de plus près, quand j’en mange trop de sucre, c’est encore pire….en tout cas, c’est rassurant de voir que l’on est pas seule car on finit par se demander si on n’est pas folle !!!! Surtout que dans mon entourage, personne n’est comme ça…..
Vraiment merci pour ton témoignage et je pense que je vais vraiment réduire le sucre (pour les féculents, le pain…,.ca va être compliqué)…..
Bravo pour ton courage ! How to say no quand tu es à un dîner ou cocktail pro sans passer pour une extrémiste ? Bonjour Garance, je ne fais pas souvent de commentaire mais, avec ce post-là, ca s’imposait pour moi ! J’ai moi aussi changé ma façon de manger depuis 3 mois, suite à des maux d’estomac de plus en plus fréquent. Et j’ai enfin pris conscience que rien n’allait dans ma façon de manger ! Le pire étant que je transmettais mes mauvaises habitudes à mes enfants ! Trop sucré, trop de protéines, du mauvais gras ! Et pourtant, venant du sud de la france, je me disais que ce n’était pas si mal ! J’ai beaucoup réduit le sucre (pas totalement mais j’ai arrêté les ruée sur les biscuits en tout genre), le gluten et le lactose. Et, ô miracle, je me sens tellement mieux ! J’ai perdu 4kg, je retrouve un corps de jeune fille, ma peau est plus belle… bref, une renaissance ! Difficile à imposer à toute la famille mais on progresse. Et quasi-impossible en societe ! C’est un nouveau monde qui s’ouvre à nous ! Bravo à toi et continuons ???. Merci pour tes partages, je te suis depuis de nombreuses années. Tout d’abord merci de partager avec nous tes expériences, avec toujours beaucoup d’honnêteté et de justesse. L’excès de sucre, particulièrement le sucre raffiné et industriel est un vrai fléau. Néanmoins,à te lire, je crois voir un autre excès. Pourquoi se passer des sucres naturels, des fruits, du miel notamment, ou des sucres non raffinés type sucres de coco, qui peuvent avoir des effets bénéfiques? Et puis renoncer au sucre, c’est aussi renoncer à une forme de douceur et de réconfort. Les effets produits sur toi par ce gâteau, trop sucré certes, semblent révéler qqc qui va au-delà d’une simple histoire de sucre, c’était trop violent pour ça. Enfin ce n’est qu’une toute petite analyse et peut être que je suis totalement à côté de la plaque. Ton expérience me fait en tous cas réfléchir, et me dire que je consomme trop de sucre, c’est sûr, et qu’une diminution me serait très certainement bénéfique. Mais, pour moi, je trouve le revirement trop extrême. On ne renonce pas si facilement à soi, à ces aspects de sa personnalité. Peut-être qu’on peut les arrondir pour vivre plus sainement avec? Merci encore d’avoir partagé avec nous, ça fait réfléchir en tous cas. Sinon le bouquin de Daniele Gerkens est tres bien et explique que pas mal de pays ont essayé de mettre en place plus d’informations sur les packagings mais à chaque fois se heurtent aux industries agro alimentaires dont les lobbys (notamment le lobby du sucre si,si) sont extrêmement puissants. Le problème de santé public est finalement peu de choses face aux intérêts économiques, triste réalité. Mais si Ca marche pour elle pourquoi insister trouver Ca extrême ? Je comprends pas pourquoi les gens comme toi s’acharnent à vouloir “normaliser socialement” l’alimentation des uns et des autres si Clairement pour elle, en ce moment, Ca ne fonctionne pas? Et puis elle peut également expérimenter. Peut être que dans un an, elle aura effectivement re-introduit le sucre naturel mais c’est son processus. Je m’étonne que tu trouves plus extrême de ne pas s’autoriser de sucre naturel que les symptômes dont elle souffre qui semblent vraiment pénible. Pour moi c’est une réaction qui est conditionnée par une norme sociale (“il faut s’autoriser des douceurs”). La société ne veut voir que ce qu’elle peut accepter. Bonjour Garance, je suis effarée par ce que je viens de lire et je m’y retrouve complètement! Moi j’ai arrêté le sucre par hasard, parce que essayant la chrono-nutrition où il y a beaucoup de sucre lent, j’avais perdu du poids certes mais mes intestins ne cessaient de gronder on aurait dit que j’avais une entité cachée là dedans qui se manifestait bien sûr quand je parlais avec un supérieur ! Du coup j’ai cherché d’où ça pouvait venir et je me suis mise au paléo, où du coup il n’y a QUE des sucres naturels: miel et fruits, plus de grondements et surtout je ne me suis jamais sentie aussi bien, mince et épanouie. Parfois dans un moment de stress je me dis je vais m’acheter un pain au chocolat ou autre et une fois devant plus d’envie. Et comme toi il m’arrive dans un repas de famille d’en avoir et un petit morceau me suffit, je ne trouve pas ça à tomber…bref moi aussi sevrée du sucre. BRAVO à toi, passe une belle journée et de bonnes fêtes et continue de nous enchanter avec ce blog que je suis tous les jours ou presque! Bonjour Garance, je ne fais pas souvent de commentaire mais, avec ce post-là, ca s’imposait pour moi ! J’ai moi aussi changé ma façon de manger depuis 3 mois, suite à des maux d’estomac de plus en plus fréquents. Et j’ai enfin pris conscience que rien n’allait dans ma façon de manger ! Le pire étant que je transmettais mes mauvaises habitudes à mes enfants ! Trop sucré, trop de protéines, du mauvais gras ! Et pourtant, venant du sud de la france, je me disais que ce n’était pas si mal ! J’ai beaucoup réduit le sucre (pas totalement mais j’ai arrêté les ruées sur les biscuits en tout genre), le gluten et le lactose. Et, ô miracle, je me sens tellement mieux ! J’ai perdu 4kg, je retrouve un corps de jeune fille, ma peau est plus belle… bref, une renaissance ! Difficile à imposer à toute la famille mais on progresse. Et quasi-impossible en societe ! Mais, c’est un nouveau monde qui s’ouvre à nous ! Bravo à toi et continuons ???. Merci pour tes partages, je te suis depuis de nombreuses années. thanks for this post,it always makes me happy to read what you want to share about your life! I quit sugar when I was 22 (now I’m 29). I used to be so tired and get weird swellings around my eyes and lips and sometimes my whole body itched,seemingly without any reason. I went to see all kinds of physicians,first my doctor for the simple colds and aches (it’s called Hausarzt in German,can’t think of the English word right now),then a dermatologist who prescribed me cortisone pills that made me look puffy and feel sleepy all the time,then another dermatologist who told me the cortisone was dosed way too high and send me to a specialist,who finally diagnosed me with being unable to digest and process sugar. It took me many many weeks of trial and error to figure out which kinds of food I can still eat and which to avoid. For me,refined sugar is the devil,for example something like a chocolate bar makes my eyes swell till I can’t even open them anymore but fruit and bread in moderation still works. Sooo…long story short: I guess it’s all about finding out what works for you and not to get discouraged by other people with different opinions and experiences (btw I totally get the part about cultural eating habits,to Germans their bread is sacred and my Grandma nearly fainted when I told her I stopped eating bread etc. on a daily basis haha). Merci pour ta sincerité et de nous ouvrir les portes de tes experciences personnelles… il y en a tellement qui te lisent et qui apprecient (et qui ne commentent pas, genre moi ) .. qu’on te souhaiterait que les commentaires malveillants ne te touchent pas ! Bravo pour cette victoire sur le sucre . Y étant moi meme très sensible depuis des années, je me sens tellement mieux sans . Ca n’empeche pas les écarts de temps en temps, mais en connaissance de cause. Et ça fait une vraie difference pour moi de savoir pourquoi je ne me sens pas bien apres des pates blanches ou un gateau… une lourde addition a payer pour un petit moment de pure gourmandise. Je le fais quand même de temps en temps mais je ré équilibre après. D’un point de vue santé , as tu enquêté du coté du syndrome PCOS ? Tu semble avoir plusieurs symptomes de ce syndrome .. les livres de Colette Harris sont d’excellents guides sur le sujet. Peut être que les commentaires ont été un peu agressifs parce que ce que tu décrivais était assez radical, assez typé “américain”. Parfois je pense qu’on a besoin de changer radicalement quelques temps et après laisser le temps faire les choses. J’imagine que le contexte dans lequel tu vis, les gens que tu côtoie doit aussi pas influer sur ton mode de vie. just reading your as always inspiring post had me reach my gingerbread cookies … I am severely addicted to sugar and I have often felt the need to stop completely. My migraines also seem to be a consequence of too much sugar intake as are my moods. Since I have observed some of this in my 6 yer old daughter I feel so bad about having exposed her to our so-called Bavarian lifestyle, with potatoes, bread, and of course cake and pie all the time. And of course there are many more topics that are important right now. But if health care is supposed to pay for all of our problems then we should really start thinking about how we live and what we eat. Maybe moderation for some of us would be a good start…. “J’avais mangé, bu, et même fumé des cigarettes, je n’avais pas fait de sport, je ne m’étais pas occupée de moi. Je m’étais régalée à m’occuper des autres. => t’étais pas bien ? Sans dec’, ta bouffer pleins de produits gras/carnée, ta bu et ta fumée, faut pas s’attendre à ce que tu pètes la forme, quel est le rapport avec le sucre ? => Ta des fringales irrésistibles, tu te met à manger du chocolat sans même pas le réalisé et tu accuse quoi ? Le sucre. Faut réfléchir, si tu as faim c’est pas à cause du sucre, c’est parce que tu as FAIM wahou c’était dur, vive la logique. “D’abord, mon humeur. Horrible. J’avais envie de m’engueuler avec tout le monde. Heureusement que j’en riais aussi, un peu – je savais que quitter le sucre n’allait pas être facile. Je me sentais épuisée, j’avais les mains moites, légèrement tremblantes. Je n’arrivais pas à y croire. => le corps marche à glucose, que des signes qui montrent à quel point ton corps te réclame de l’énergie. DE L’ENERGIE pas que tu es toxico. Les gens sont fous c’est énervant. => COMMENT TU PEUX ECRIRE CA !!! Si ton corps veut de la nourriture c’est que tu ne manges pas assez. Si tu as pas des troubles du comportement avec ça ! Parce que résister à la faim avec sa volonté c’est quoi ? Quand tu as soif tu bois non ? Pourquoi quand tu as faim tu résistes ? => déprimant ! Tu te prends pour une droguée alors que ton corps veut juste ce qui est le mieux pour lui, les glucides. Tu bouffes des oeufs, du saumon, de l’avocat que du gras. Combien de temps tu vas tenir ? Est-ce que manger tout ce gras qui encombre le corps sur le long terme va être bénéfique pour ta santé ? Pourquoi les gens font des recherches sur le sucre comme une drogue mais, pas sur le gras comme du gras ? => Jamiiiieee y a quelqu’un qui est pas capable de faire des connexions ici ! => Tu ne manges plus de petit déj. Normal le soir tu manges protéines et gras. Ton corps rame pendant des jours pour digéré et s’en sortir donc il ne réclame plus rien, il sait que s’il réclame tu lui redonnera de la merde dont il n’a pas besoin ! => pourquoi accusé le sucre ? Le gâteau était le parfait mélange gras/sucre mais, au lieu d’accusé le gras et les produits animaux contenu dedans tu accuses le sucre de te faire sentir mal ? Et les pomme de terre sérieux ? On en mange depuis le 16ème siècle en France réveil toi c’est pas la pomme de terre le problème ! Ça fait 3mois que je manges 3000kcal par jours, que des GLUCIDES, devenu vegan sans aucun restriction, vivant dans l’abondance, le matin s’est smoothie 7bananes et sucre complet. Je pète la forme comme jamais, aucun crash dans ma journée, une énergie et une humeur constante, dès que j’ai faim je lange des fruits, des fruits séchés ou des glucides propres (pas de gras) à mon corps et il se régale. Quand j’ai commencé ce mode de vie je pleurai de joie et dansais comme une folle avant mes repas, mon corps comprenait que j’allais lui donner l’énergie qu’il préfère du glucose qui se transforme directement en énergie dans le corps ou est stocké en glycogène pour nourrir tes cellules. Oui car toutes tes cellules marchent au glucose, ainsi que ton cerveau, tes muscles, enfin tout en fait. A part si tu as moins de 5ans, le gras ne doit pas dépasser les 10% de ton alimentation, c’est le principe du 80% de glucides, 10% de lipides, 10% de protéines (qui soit dit en passant n’a rien à faire dans le corps humain, manger des bananes apportent la parfaite dose de l’ensemble, la dose idéale pour le corps humain). Je suis une ancienne anorexique boulimique (vomitive) et grâce à ce mode d’alimentation aucune crise, plus rien. J’ai arrêté de penser à la nourriture, j’ai enfin envie d’aller voir les autres, de les aider, de leur parler, je m’enferme plus chez moi, que du positif ! Niveau santé, je n’ai jamais été aussi bien ! (tu parles de diabète et de glycémie mais, sais-tu que le gras entour les cellules qui empêche l’insuline de fonctionné et que de ce fait le sucre rester coincé à l’extérieur ? Mais supprime le gras et l’insuline fonctionne de nouveau et le sucre pénètre la cellule, les plus grands scientifiques le disent et donnent le conseil d’arrêté le gras). Je n’ai pris aucun poids ni perdu mais, je m’en fiche parce que mon estime de moi est bien meilleur qu’avant, plus de crise de larme parce que je me trouve grosse. Et je commence à perdre ma cellulite bref je vie, j’ai de l’énergie et je suis heureuse. Cela marchera sur le long terme car c’est ce que ton corps a besoin. Tape vegan hclf sur youtube et tu verras que des bonnes choses. Mon commentaire n’est pas à prendre méchamment, je ne veux que ton bien. Bisous. Nom d’un chien mais pour qui vous prenez-vous ? Savez-vous que, bien que planquée derrière votre ordinateur, vous vous adressez à un autre être humain ? Bon, et pour ce qui est de faire des connexions comme vous dites, franchement relisez-vous… Vous faites exactement ce que vous reprochez à Garance, sauf que votre sucre à vous c’est le gras. Si vous n’êtes pas capable de vous modérez, n’attendez pas des autres qu’ils le soient. Si vous n’êtes pas capable d’accepter que ce post n’est que le “retour d’experience” PERSONNEL de Garance, (sans inciter qui que ce soit à faire de même, notez le bien) alors ne nous imposez pas vos élucubrations sur vos 3000kcal / jour (est-ce bien raisonnable, franchement ?) comme une vérité générale qui devrait s’appliquer à tous. Si cela vous convient tant mieux, si cela convient à Garance tant mieux aussi, libre à chacun d’exprimer ses doutes mais par pitié, faites preuve d’un peu de pertinence et de politesse, ce ne sera pas du luxe. P.S. : ne le prenez pas méchamment, je ne vous veux pas de mal. je me demande si cette manière tellement arrogante d’argumenter est efficace…tant qu’à tenter d’informer , ce qui semble ton objectif, pourquoi ne pas y mettre un peu de pédagogie et de la bienveillance ? encore une fois si elle ca lui convient pourquoi s’acharner a partir en croisade contre son mode de vie. Et franchement votre commentaire est tres agressif et irrespectueux. Vous devriez respecter le principe de base en commentant: respect et bienveillance. En plus du ton qui est parfaitement insupportable, je ne pense pas qu’il faille accorder du crédit à votre commentaire, cela me semble être un ramassis de non-sens d’un point de vue diététique. – aucun nutritionniste ne vous recommandera un 80% glucides / 10% P / 10% L. aucun. – les 7 bananes le matin en smoothie ca me parait parfaitement desequilibré. le sucre complet ca reste du sucre raffiné sauf erreur. – aussi, ca n’a absolument aucun sens de fonctionner en calories. Les calories ne se valent pas nutritivement. J’ai trouvé ton témoignage très intéressant et je te remercie de l’avoir partagé avec nous. Et c’est très agréable de te lire à nouveau ! Candida Albicans, responsable de la Candidose. Bactérie installée dans l’intestin grêle et qui se nourrit de… sucre. Provoque tous ces ravages et ces symptômes lorsqu’elle prolifère. Réfractaire aux antibiotiques. Le seul moyen de s’en débarrasser : un long régime sans sucre, simple et complexes, raffinés ou non. have you watched the Netflix documentary ‘What the health’? Even though it is way over the top with the recovery stories, it still has a valuable message about animal fats. Eating eggs every morning might not be a great idea after all. Just saying there are so many different views on things. But the constant is that we should all really see what is happening in the industrial animal consumption – it is wrong in every level. Thank you so very much for sharing this. I have been considering taking this same path and this gives me some insight. Cheers to better health and happier lives! Thank you so much for sharing your story!!! I totally resonate with it. Listening to your body and inner voice doesn’t come easy but it’s certainly one of our greatest strenghts. I’m not perfect at it but I’ve made a lot of progress in following my body and intuition when it comes to my wellbeing, even if that means ignoring the culture, society, family’s advice ( which often are well intended). You’ve mentioned a delicious almond bread reciepe. May I ask which one do you use? Stay strong on your own journey. You have dealt with something really big, and taken charge of your health. I hope you are generous with yourself and celebrate this accomplishment often–just not with sugar–haha! The mind/body connection is real, and tuning into your body’s subtleties requires discipline and practice. Then stopping the addiction, and sharing it with the world–so hard! 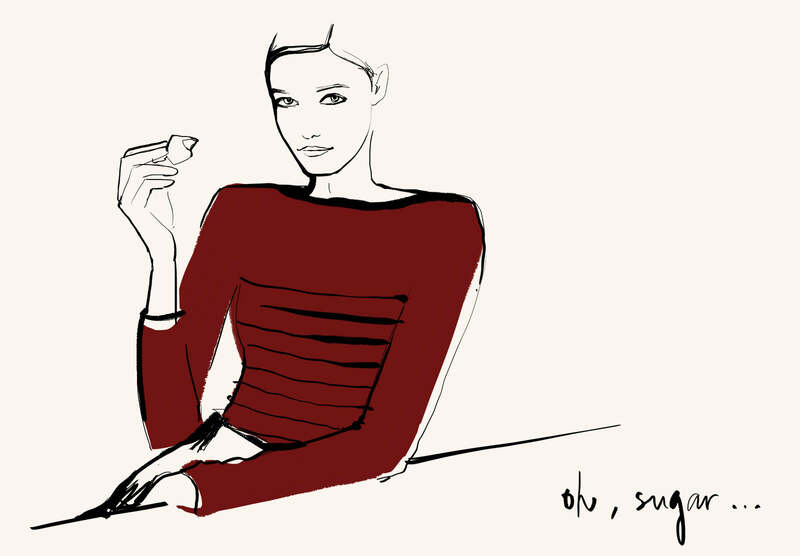 Your blunt retelling about the relapse is why we love you, Garance. The conversation and support you have here is like a 12-Step program, the criticism is not. Hard not to take that inside, even though it comes from other’s own sense of inadequacy. Quitting sugar was just the first step–then there’s a world of change to also deal with that revolves around it. You’ve inspired me to try too. Merci pour ce post. Ce serait intéressant d’en écrire un avec le détail de menus possibles, sur une semaine ou quelques jours ! I have never written a comment before on any website but your story resonated with me so much. I used to have the same symptoms and I’ve been recently diagnosed with insulin resistance, a condition that can lead to type 2 diabetes if not managed properly. I’m sure you have come across the term if you read a lot about sugar however I just wanted to draw your attention to it in case you haven’t heard about this condition before. In my case insulin resistance lead to PCOS, a hormonal imbalance which is a very common cause of infertility. Diet, exercise and in some cases drugs can improve these conditions. Best of luck with your sugar-free journey, I quit sugar too (except for a small amount of fruit daily)! Merci pour ce témoignage. J avais également laissé un commentaire sec sur le précédent post. Oups. Garance, thank you for being brave and vulnerable and sharing your story. I love hearing your words and your journey. It’s good Garance found something that works for her. Honestly, I feel like the real enemy is not sugar in itself but how the food-processing industry has used it…Same for gluten, it’s not so surprising that many people develop gluten intolerance after decades of processed food being forcefed to us (thanks marketing). One last remark: Garance, you always tell about the importance of listening to you body. But when your body asks for something sweet, how did you know you were not making a mistake ?? this post is so interesting, thank you!! Your experience is really important for me… I would stop eating sugar but I don’t know how and what I can eat instead. Unfortunately I can’t eat almond, tomatoes and raw vegetables. Can I ask you the names of some documentaries, or websites? Maybe something will help me. Way to go Garance! I am so glad people are talking about making healthy changes to their lifestlye – because it is truly a lifestyle change, not a ‘diet’. Sugar is as highly addictive as cocaine, which I am sure you have heard in some of the documentaries. Check out ‘That Sugar Film’ if you haven’t seen it, it’s great!! As far as the haters out there – ignore them. My husband and I call it the Gwyneth Paltrow effect (since people hate on her constantly for living a healthy lifestyle). People hate on others that are disciplined and healthy because it draws attention to their lack thereof. Instead of being supportive, people are critical which has everything to do with them and nothing to do with you. I’m a wellness coach/personal trainer so I see it every single day. You should be super proud of yourself for taking care of you and making changes that will keep you healthy and fit for a long, long time! Congrats!! Bonjour Garance. J’ai lu avec beaucoup d’attention ton article. Il m’a fait réfléchir sur cette attitude qui consiste à bannir UN élément de notre nutrition. Gluten, matières grasses animales, viande, sucre, etc. Or, nous sommes omnivores, sauf cas très restreints d’intolérance. Il serait intéressant d’ailleurs de se pencher sur les restrictions alimentaires imposées par diverses religions, et ceci depuis des siècles… Mais c’est un autre débat. Donc, pour le sucre. Tu dis avoir faim à la fin des repas, si tu n’as pas de dessert sucré. En bon bec sucré, en fait tu laisses de la place pour le sucre en fin de repas. Moi, qui n’ai jamais aimé le sucré, le dessert… me semble toujours en trop et je n’en prends pas. Je ne lui laisse pas de place ! Tu as donc raison de restreindre ta consommation, nous consommons 10 fois plus de sucre que nos grands parents. Cependant, là où il faut plutôt faire attention c’est à tous les produits transformés, industriels, les sucres cachés. Privilégier les sucres lents, toujours pareil avec modération. Et une part de tarte fine aux pommes saupoudrée d’un nuage (pas d’une tonne) de sucre roux légèrement caramélisé au four (là, tu la vois, ta part de tarte ?) n’a jamais fait de mal à qui que ce soit. Et surtout, surtout, penser que ton corps a besoin de plaisir et non de contraintes. Fais-lui plaisir en choisissant des aliments sains, sans rien bannir si tu en sens l’envie, il te le rendra. Quand j’entends “envie”, ce n’est pas cette sorte de compulsion irrépressible, mais une envie réfléchie de la veille pour le lendemain. Et puis, pense aussi à la pré-ménopause, qui induit bien souvent des orages hormonaux. Dear Garance, thanks for this post. I think that listening to your body is extremely important, but not everybody has the same degree of “self-awareness”, so we often lapse into behaviours that hurt us because we simply don’t realize it. Kudos to you for being so perceptive. However, I think that sometimes even the desire for some “bad” foods can be driven by our bodies’ needs (e.g. when my blood pressure is low, I crave chips! I think it’s a way for my body to say “hey, 55-88 is too low, let’s raise that a bit with some salt” ;) When my pressure goes back to normal, I don’t care about chips any more. ). I find the reaction of people rather puzzling. I became a vegetarian just a year ago, and I’ve had to bear all sorts of bad comments because of that. Sometimes you even feel you should hide your choices in order not to be given a hard time about them. I understand food is such a big part of our culture, but I always thought that being together with your relatives and friends for a meal should be the important thing, not eating this or that specific food. I wish you (and everybody) luck for Christmas – it’s always a difficult occasion when you are not eating “like everybody else”! Garance, do you have any resources to share on cutting out sugar/ replacing with other good things? Books or blogs you could recommend? I am a 52 year old yoga teacher with a very healthy diet -eat mainly veg and always cook everything at home from scratch – but with a bad carb habit which sneaks in every so often! Although I have always loved bread I can go weeks without it, not missing it at all, don’t go in for sweet things too much either but then I accept a slice of a friend’s delicious fresh-from-the-oven homemade sourdough which sends me in to a downward spiral and I go for a full on carb feast for days! Maybe sneaking a croissant mid morning (I don’t usually eat until after 1pm) which then leads to buying some horrid cheap chocolate at the petrol station. I instantly feel that horrid disorientation you described, with hot flushes and feel sick but the next day I’ll do the same and continue for a few days until something shocks me out of it -usually a really busy day when I have no time to stop for snacks. In my 20’s I had a very carb heavy diet. But always stayed a uk size 8 so never thought of the effect that was having on my body. I’ve never been much of a drinker but on the past few years my tolerance has lowered dramatically now even the smell of a white wine sends my stomach into panic expecting the acidic onslaught. Having just returned from an amazingly informative menopause yoga retreat in Spain (I’m peri-menopausal) where medical nutritionalists and herbalists talked about the relationship between diet and menopause and also diseases which come later in life it was an instant lightbulb moment (or rather a brightening of the lightbulb which had been glowing so dimly I couldn’t see clearly!). It upsets me that so many diseases in the world and much of the obesity could be cured if we lost most of the processed foods lining the shelves in our supermarkets. Love this post, although I wouldn’t just look at sugar. It sounds like you may be experiencing a little Perimenopause as well. I would definitely do a little research. It can start as early as 30, most women are not even aware. Giving up and cutting back on sugar is a good thing, but hormones can be the root cause of a lot of what you’re dealing with. Oh la vache… J’ai les mêmes symptômes que ceux que tu décris en première partie de ce billet. Crises d’angoisse, douleurs dans la nuque et aux trapèzes, un goût prononcé pour les choses sucrées, adoration pour le dessert sucré… bref je m’y retrouve complètement. & c’est franchement flippant, c’est vrai. Je pensais que c’était dû à mon style de vie, maman entrepreneure, beaucoup de choses à gérer et beaucoup d’aspirations, toujours être sur tous les fronts. Je vais creuser la question et me renseigner sur les méfaits du sucre. Car je suis sûre, après avoir lu ton billet, que beaucoup de mes maux sont liés à cela. Merci d’avoir soulevé la question Garance. J’ai 51 ans, et je suis ménopausée depuis mes 47 ans, tôt, comme ma mère ! Comme tu le sais, ces fichues variations hormonales induisent encore plus de fringales qu’avant, et on a tendance à grossir et à stocker autour du ventre. En avril 2013, après avoir lu le livre de la journaliste au Elle français Danielle Jerkens (“Zéro sucre”), j’ai arrêté tous les sucres “raffinés” (jus de fruit, chocolat, gâteaux, bonbons etc…), en conservant les sucres lents type tous féculents, ainsi que les fruits. J’ai perdu 6 kilos en un an et suis revenue à mon poids de forme. J’en ai parlé à ma gynécologue, qui m’a dit que pour beaucoup de femmes il était quasi impossible de renoncer au sucre. Quand on sait que la consommation de sucre raffiné des Français est passée de 5 kilos par an dans les années 50 à 30 kilos actuellement (et c’est pire encore pour les Américains et beaucoup d’autres sociétés, qui n’ont pas la culture du repas à la française), on peut comparer le sucre à l’amiante ou à la cigarette. Le lobby du sucre a d’ailleurs exactement le même comportement que le lobby de la cigarette, mensonges et distorsions des expertises. Alors je ne trouve pas que tu sois très “américaine”, juste plus réactive et sans doute un peu plus informée. Et si c’est bon pour toi et moi d’arrêter le sucre raffiné, c’est sans doute bon pour beaucoup d’autres, hommes et femmes ! Très bonne fêtes, avec beaucoup de bons fruits ! Fantastic post. I’m going through something similar right now (trying to reverse insulin resistence). I would love to see you recipe for almond bread if possible? I loved this post! When it comes to health or nutrition I feel people love to tell what right or wrong but your message of listen to your body and be aware when its speaking (sometimes shouting) to you. I recently stumbled upon Loren Lockman, he’s all about fasting and he agrees he only eats breakfast if he is hungry! So I think you are really doing your body good and you are super inspiring! Thanks!!! P.S i also would love recipe for almond bread <3 ty! Thank you for sharing your story! I am so inspired to try to also cut sugar from my diet. I think it is present EVERYWHERE even when we don’t realize.. and that gluten and sugar are in many ways, “in bed together”. But can you tell us a bit more of what your meals look like now? What books/documentaries could you recommend? I am just scared about the period it will take to wean myself from the addiction…. Merci !! C’est grâce a ton premier article sur le sujet du sucre que j’ai amorcé une réflexion a ce sujet.. Et un peu comme ça, j’ai décide d’arrêter le sucre (je garde les fruits, l’alcool, le miel) et quand j’ai annoncé ça autour de moi (toujours très simplement, en refusant par exp une part de gâteau ou un gros beignet “non ‘merci j’arrête le sucre !”) j’ai être très surprise par les réactions que cela a provoqué…. La grande ‘majorité des gens ce sont moqués de moi, de plein de façons et ce sont montres parfois très agressifs. Moi qui m’attendait plutôt a des ” ah, pourquoi?” peu sont ceux qui ont voulut comprendre. Bref ! Merci ‘pour tout c’est toujours très intéressant et inspirant !! I’m so glad you found a form of eating that makes you feel good. A quick review of recent popular documentaries on sugar shows a lot of quasi-science and pure speculation wrapped up as researched fact. This technique – speculatively applying lots of bad results to a single cause – is the exact sort of anti-science propaganda used to scare people from life-saving vaccines and that prevents them from acting on climate change. There is NO question that Americans, in particular, eat too much refined and added sugar – and there is quite a bit of research to show the deleterious effects that consumption is having on us. But if you were to, say, include a few links to well-researched information that helped you in your journey, it might help the cause of the thousands of public health researchers and scientists who want to make everyone healthier. I know how you feel, sugar has long been my “addiction” and I know I cannot control my intake as other people can maybe do. I have finally given it up since a mont or so, after many trials during the years. Bulletproof coffee helps me too and adding fats and reducing the carbs to a minimum. I haven’t lost weight but I finally feel I am not hungry all the time,I am not a slave of sugar any more. It took me time, I first quitted only sugar in coffee and started doing some researches until I felt ready and convinced it was time. Not everybody is the same, as you say some people can handle it but for me it’s like going to rehab. I have to quit it ’cause I cannot have “just a bit” , I am a sugarholic on detox. thanks for sharing your journey. La nutrition est un sujet très complexe, à la fois rattaché aux émotions et à l’identité, aux “sciences”, aux “croyances” et sûrement à chacun de nos corps. Apparemment tu revis sans la tyrannie du sucre dans ta vie. Grand bien t’en fasse ! Trouver son équilibre est un chemin de chaque instant, c’est comme marcher ! Pour autant quelques éléments dans ce que tu dis me questionnent -pas pour toi en général mais pour le tout un chacun : tu parles de “sucre” sans distinguer gâteaux (sucre blanc raffiné en poudre), confiture (avec plus de 50% de sucre pur !) pommes de terre, graines en général ou fruits. Ce sont quand même des sucres très différents avec des effets physiques qui ne se recoupent absolument pas (notamment dans les pics d’insuline). Il y a une grande différence entre de la confiture et une pomme. le corps ne les reconnaît pas comme le même sucre. Enfin, tout le monde devrait savoir que le glucose est l’aliment UNIQUE qui nourrit notre cerveau (pas le gras !). Encore une fois, cela explique pourquoi notre cerveau réagit tant à un produit sucré industriel car il a besoin de sucre ! Seulement le sucre pur (raffiné !) sans fibres notamment va faire carburer le cerveau à haute dose (comme une accélération rapide en voiture)…. pas très bon. Mais, à l’inverse, sans glucose (sans fruits, sans grains donc) il sera fatigué, irritable, en panne…. Je ne suis pas du TOUT dans la critique de ton alimentation (j’ai moi même une alimentation “hors norme”) et tant mieux si ce choix te convient mais je pense que le sujet est assez complexe et compliqué pour qu’on ne confonde pas tous les “sucres”. Dans tous les cas bon chemin avec ou sans sucres ! I just happened to stubble on this article. I can completely relate to your experience. I’m a fellow Doré, too and type 2 diabetes runs in my family as well. When I gave up sugar, I had a similar experience as you. It definitely took more than three days! I also experienced PAWS (post-acute withdrawal syndrome). About a few months without sugar, the cravings and withdrawal symptoms came back with a vengeance. While at a regularly scheduled check up, I asked my doctor if it could be possible for me to be experiencing PAWS and she said yes. Unfortunately, I eat sweets again but not like I did. Like you, I don’t need it after every meal and now I can save it for special occasions. I was so extreme for a while I wouldn’t eat bananas, bread or potatoes. I’m now on a journey to find balance in what I eat. Thanks for sharing. L’an dernier, je m’enfilais volontiers la moitié d’un paquet (ok, les 3/4) de Michoko en corrigeant mes copies le soir, comme toi, sans même me rendre compte que je mettais la main dans le paquet toutes les 2 minutes. Je me suis réveillée vers 5 heures avec une intense migraine le lendemain matin, une fois, deux fois, trois fois… cela ne pouvait pas être une coïncidence. J’ai décidé d’arrêter le chocolat. Cold turkey comme on dit chez toi. Et voilà, ça fait un an et le plus drôle, c’est que ça ne me manque pas du tout. J’ai perdu un ou 2 kilos, mais ça n’était pas le but, je souhaitais ne plus jamais avoir de migraines comme ça. Un mois après, mon mari me parle de mon amour maladif du pain (disons la baguette) et du beurre (et des croissants et autres viennoiseries) C’est vrai qu’en janvier 2017, je mange allègrement une (ou une et demi) baguette beurrée par jour + croissant ou pain au choc. En me pesant, je constate que je pèse le même poids que quand je suis allée accoucher de mon fils, 15 ans plus tôt, j’avais pris 18 kg… Ce chiffre de 77kg me saute au visage, je me sens toute gonflée, lourde, sans énergie, je dors mal aussi. Le 15 janvier, je décide d’arrêter le pain, les croissants etc. Du jour au lendemain. Je perds 11 kilos en 6 mois. Mon poids est stabilisé, entre 65 et 66 kg depuis 5mois. Je me sens tellement mieux, je remets des vêtements que j’adorais (jeans) Bref, quelle libération! Le plus drôle? ça ne m’a jamais manqué! même quand je passe devant la boulangerie plusieurs fois par jour et que je sens les effluves odorantes du pain en train de cuire. le pain et moi, c’est définitivement fini! Les oeufs le matin, le jambon et le fromage, j’adore!! Bonne continuation sur ton chemin! Super inspirant, je te suis depuis le début, et c’est la première fois que je me retrouve 100% dans ce que tu dis ! J’ai arrêté le sucre industriel il y a peut être 3 ans maintenant, et à l’époque j’étais considérée comme révolutionnaire ou rebelle ! Le sucre et moi c’était… La plus grande histoire d’amour ! Well done d’avoir arrêté TOUS les sucres, type pain, pomme de terre etc. ! Je vais essayer de passer à un petit déjeuner sugar free comme tu le conseilles (parfois je m’accorde du sirop d’agave ou du miel, qui sont des sucres naturels). Et si tu recommandes des livres à ce sujet, je suis preneuse ! Merci pour ce beau témoignage ! Merci ! Le sujet du sucre en France est totalement tabou. On dit “qu’un peu ne fait pas de mal”, “c’est même nécessaire”. Or, c’est faux. Le sucre est une drogue. Les Américains ont réellement passé un cap à ce niveau. Le vrai fléau de notre époque n’est pas le gras, mais le sucre. Ce discours est encore censuré en France. J’ai arrêté le sucre il y a des années déjà. Je suis passée par tes phases. Dramatiques. Et difficile à partager avec son entourage car personne ne suit cette idée. Mais mon teint, mon énergie (diffuse et continue comme tu dis), ma façon de voir la vie, ma santé… tout s’est amélioré. Une sorte de renaissance. Voilà des années que je ne mange plus de sucré, et je suis tellement heureuse ! Des œufs au petit-déjeuner: oui, moi aussi depuis 10 ans ! Merci d’avoir osé parler de ce sujet publiquement ! Au delà d’être une “mode”, la prise de conscience que le sucre raffiné est mauvais, et bel et bien une drogue est un phénomène vraiment important actuellement. Avec ou sans lire des choses sur le sujet, et avec une expérience assez instinctive te concernant, cela met parfaitement en lumière les choses. En tant qu’adoratrice du moment “petit déjeuner”, j’ai pour ma part encore beaucoup de mal à envisager l’arrêt de mes tartines pain / beurre / miel… mais qui sait, un jour peut être, j’y arriverai. Si j’observe bien, je mange finalement assez peu de sucre raffiné / produits industriels. En revanche, je ne pourrai pas finir un repas sans un fruit. Ils rythment pour moi de façon hyper importante les saisons qui passent et mon plaisir des repas. Sucre naturel, certes, mais les as tu supprimé de ton alimentation pour retrouver un équilibre ? Ou font-il parti de ce tu tolères ? Merci Garance pour cette longue article. Je viens de Hong Kong et j’ai aussi commencé de réduire ma consommation du sucre il y a 2 mois. C’est tellement CHER!!! Tout d’abord presque tout est sucré surtout si on se rendre sur des grandes surfaces, il est difficile de remplir mon panier sans farine et patate… et ce, mon budget alimentaire a depuis sauté plus de 200%. Manager sans sucre demande beaucoup de légumes frais. 3 têtes de brocolis durent 1 jour, pour le même prix, un sac de pommes de terres peut durer une semaine. J’aimerais tellement de continuer car je me sens bien d’être moins dépendant du sucre mais je ne pense pas d’avoir le moyen. Peut-être vous pouvez partager des suggestions “budget” (idée de nouveau livre? )pour ceux et celles entre nous qui s’intéressent sur ce sujet. Yen Yen, thank you for bringing this up. I, actually, struggle with the same thing. Eathing well and healthy is simply not cheap, and, for some uf us, unfortunately, not even affordable. I think that it is one of the reasons why this topic and Garance’s previous entry on this matter sparked such a strong reaction. Simply, food choices are inevitably a class issue, whether you care to admit it or not. Why is it that those healthy, lean-proteiny and non-sugary options are ALWAYS the most expensive items to shop for or opt in a menu in any restaurant or a diner? I wish I could live 100% sugar free, but then I might end up not having the means to pay my rent or anything else.. I was definitely among not the critics but definitely the slightly concerned after reading your previous post. I found this one very empowering and beautifully written. The tone is so positive and appeased at the same time. It is so great that you found what works for you and makes you happy. I am working on my caffeine intake, rough route ahead. Thank you for sharing. Congrats Garance on finding a way of eating that helps you feel better! And congrats on making some healthy changes in your life that are good for your body. I am a doctor, and I feel that some of your comments in your article are grossly misleading to your audience. As you obviously have a huge influence on your readers (see above comments of those who plan to make similar changes), I feel you have a responsibility to the public to promote healthy behavior that is grounded in SCIENTIFIC EVIDENCE. When you write things such: “I had gotten my blood drawn a few months prior and my sugar levels were normal, according to my doctor. But when I did my own research, I finally learned those tests often don’t detect the problem until it’s already too late.” you directly undermine people’s trust in their doctors and the medical system, which is EVIDENCE based and shows incredibly good outcomes. This is blatantly false information you are giving to your readers. I would love to see the “research” you describe delineating the problems with the extremely precise HgA1C and fasting glucose measurements we draw on people every day. Further, the “signs” you mention: “having a little bit of a sweet tooth. Needing to go to the bathroom frequently. Your heart pounding after you eat sugar. Feeling extremely hungry right after eating. Gaining weight around the stomach area” might be symptoms that are making you feel bad, but without actual correlating numbers of high blood sugar, you shouldn’t scare people into believing they have diabetes (which it sounds like you never clinically had). Again, I really appreciate that you are sharing how you adopted a healthy lifestyle, and I hope this inspires others to eat healthier too. But I really hesitate to tie your story to medical diagnoses and conditions (of diabetes, of high blood sugar, which again, you never ACTUALLY had), as it promotes pseudoscience and undermines public trust of the healthcare systems and in their primary care doctors. Merci Garance pour ce post. Je suis peinée quant aux commentaires déplacés de celui d’octobre… (la majorité des françaises). Je suis praticienne de Médecine Traditionnelle Chinoise et oui on le sait le sucre est une vraie merde. Et le fait qu’on en fasse un art gastronomique ne sert à mon sens qu’à légitimer une addiction comme une autre. Et dont souvent les victimes ne sent rendent pas compte, par habitude. Et quand je lis que c’est une histoire de milieu et de sous!!!! J’hurle de rire : il n’y a qu’à comparer le prix d’un kilo de barre chocolatée genre kinder bueno, avec un kilo d’amandes. Tu as tout mon respect et ma gratitude pour rester sur ta voie et nous nourrir de si belles expériences. I did a cleanse a couple of times for a good 3-4wks…it wasn’t hard because the more you plan your meals and are ready when hungry (our low point) you start to crave less and less of the bad stuff (sugary processed and refined…) and food tastes delicious! every mouthful of what is perceived as boring, bland food in mainstream media/life is really amazing…food tastes so delicious! sujet : faut il les limiter ? je ne parle evidemment pas de la banane dont on sait qu elle est vraiment trop riche mais disons les bons fruits aux vertus « bulletproof » comme les clementines, les kiwis, les poires.. tu en manges ou rarement ? j entends par là, a terme dans l ideal, faudrait il egalement songer a s en passer ? Great post, thank you for sharing your experience Garance. I would like to try to cut back on sugar; could you give us some ideas for sugar free or low sugar breakfast foods? Thank you, Garance, for sharing your story. I’ve never had much of a sweet tooth, but being from Southern Europe I also grew up on a Mediterranean diet, so bread has always been a staple. In the past years I have changed my diet as well, eating less and less sugar and grains. So, whenever I had cake or anything made with refined-sugar, I would get high. Really high. It sounds like a joke (my friends make fun of me), but it’s very true. The symptoms you describe are also very relatable, and you really inspire me to see if any of them cease as I lower my sugar intake even more. Could you please share your list of documentaries? Thank you! As a medical doctor with knowledge of this issue, and given the symptoms that you describe, I think that you need to be checked for diabetes. It is not just the blood sugar level that needs to be tested but a few other blood tests that need to be dine, including glucosylated haemoglobin. Also, the body needs all the nutrients. A completely sugar (or carbohydrate) – free diet cannot be sustained for the very long term. The main issue is balance: eat in moderation. Carbohydrates are not to be blamed for everything, although you are right that they can cause problems in excess. I totally identify with your piece! I gave up sugar about three or four years ago. Over the past year, I have allowed it back into my life in small amounts. I keep telling myself to return to not having any sugar because I just don’t feel as well when I have sugar/flour products. This was a great reminder! Thank you for your honest sharing. I have been on a similar journey following Brightline eating (no sugar, no flour, no snacks just three healthy meals) and have been so surprised at how happy my body and my brain are. Like you I thought that the effects that sugar were causing me were ‘just who I was’. It is counter cultural for sure but worth it. Je me suis d’abord moquée de ses déjeuners. Puis j’ai essayé. C’est vrai, ça change tout. Sauf que j’aime trop le chocolat et les gateaux, donc je suis plus flexible que lui. En plus, j’ai fait du diabète gestationnel pendant ma grossesse, donc la privation totale de sucre me rappelle un supplice, je ne peux pas. Mais quand tu commences à regarder de près les compositions de ce que tu achètes, ça fait peur. L’industrie du sucre est hyper balèze! Brava to you for sharing this beautifully told story! Please ignore the haters who disparage this subject, or want you talk about bigger issues. This is your site and you do as you please. You have matured into a fine thinker and writer. My traditional Chinese medicine doctor–whose treatments changed my life–says that while we should stay away from sugar in our diets, our bodies require the complex sugars from fruit. He also says that if you are not hungry in the morning, it’s because you ate dinner too late the night before, or ate too much at night. Healthy bodies need something in the morning besides coffee to balance blood sugar levels. He works with Western fertility doctors and many of his patients trying to conceive have gotten pregnant after keeping their bodies “pure” for three months, meaning no alcohol or drugs, even over-the-counter pills. Even better if the man can do it too since alcohol affects sperm quality. Bonne chance to you! I also quit sugar 9 months ago – but only industrial sugar and honey. I still eat fruits, in small amounts, and bread (without sugar, which is not very difficult to find here in Europe), rice, noodles. I feel so much better without sugar, and find it amazing, how sweet carrots or red pepper can taste after a while. Good luck and all the best for the upcoming holiday-season and for 2018! Thank you for your eye opening article. I gave up sugar in the Spring because of inflammation in my knees caused by arthritis. I’m wise enough to know that sugar causes inflammation and rather than medicate myself I wanted to go to the cause and fix it. It’s been 8 months now. I’ve lost almost 40 pounds and I feel so much better in every possible way. I also don’t eat breakfast if I’m not hungry. I have stopped all the food cravings and my mind is clear. I don’t think folks realize what harm you can do to your body with sugar. For those reading this article, if you have symptoms as above, you may want to try this simple way of feeling better without pharmaceuticals. Sugar may be one of the worst “drugs” you can expose yourself to. Thank you for sharing this with us, but why such a long and detailed story? Thank you for sharing your journey! I find it so interesting that many people reject this truth and actually get very angry about it. It tells you something, doesn’t it? I’ve been experiencing these symptoms for some time and they are getting worse. I know what I need to do. I work in health care and know what will happen if I don’t. I am confident I can get there especially when I hear from those on the other side! Have you ever been tested for hypoglycemia? I have it and the way you describe how sugar makes you feel sounds way too familiar. It is not detected in the usual sugar tests, your doctor would have to order a special one in which you drink something really sweet and they test your blood every hour for 4 hours to see the spikes. It helped me a lot to know how to eat and how not eat to keep everything under control. Good luck! BRAVO, bravo, bravo!!!! so honest, so true about the evil that sugar is and yet we all seem to struggle with it in some form :/ I bought a book a long while ago (Barnes & Noble or amazon) called “Lick the Sugar Habit” and it was great, and i’ve fallen a bit off the wagon… but now i’m inspired to “give the gift to myself” in 2018 as your reader said :) thanks for that Garance! Merci de partager cette experience. J ai des crises d anxiete. Et je vais essayer de suivre vos conseils. J’ai bcp aimé lire ton récit! Je connais depuis l’enfance des pics réguliers d’hypoglycémie et j’ai remarqué que je me portais bcp mieux en réduisant le sucre, notamment pour le petit déjeuner et les collations. Il faut faire ce qu’on ressent être le mieux pour soi, même si ce n’est pas “socialement acceptable”. Wow, you have stirred a hornet’s nest with this post! I believe everyone has a love-hate relationship with this substance. Personally, I am trying my best to give up sugar by eliminating white foods (bread, pasta, potatoes) and sweets (cookie, cakes, chocolates) from my diet. It is the sweet treats/snacks that are the most difficult for me. What did you eat to replace treats? Also, do you have any recipes for vegetables that you especially enjoyed? Good story, and yes, drama filled. Do we all really have to fall in line with one train of thought? How boring the world will be if we can’t freely express our thoughts–here and everywhere–without being attacked for our differing opinions. Think about it. Do you really want your voice to be censured for the sake of popularity? I say just as Garance has the freedom to post her–great–articles, everyone has the right to respond honestly as long as there is no unnecessary name calling. It’s called freedom of expression, people! It is everywhere and somehow hopefully as our brain needs it. It is all about knowing your own constitution, how it changes from a baby to an older person. We all are different and they are many ways to take care of your type. It is all about preventing and not only healing. It has nothing to do with what you explain and as with any addiction you need to go slowly and precisely. You start all your sentences with I … think about that, then you did write nonsenses. One type of sugar might be a poison , for almost everyone. But taking care of your “agni” goes far beyond what you eat. It will not happen in days , but much longer if you understand how it really works for you which is of no use for others…. This sounds like it was a good decision for you. I have been toying with the idea of leaving sugar behind for good, and your article has given me the courage to give it a shot. All of my blood work was “picture perfect” according to the nurse who explained it to me a few months ago, but I don’t feel “picture perfect”. I also notice that my body feels differently after I consume sugar or even a high starch meal (like pizza…). I don’t want to invite trouble. Since the sugar in breads and baked goods are not really adding to my health, giving them up – at least for a time – may be a good idea. Thank you for writing this. I gave up sugar about 5 years ago-probably longer than that. I just decided one day and stuck with it. Bonjour Garance, j’ai vécu un peu la même expérience que toi avec la viande que mon corps a du mal à assimiler. J’ai donc décidé de devenir végétarienne (aussi pour des raisons éthiques) il y a quelques années et j’ai eu l’impression de faire un coming out avec mon entourage. Je me suis retrouvée (et encore aujourd’hui) face à beaucoup d’incompréhension. En fait, une décision pareille dérange les autres, il faut passer outre et s’écouter soi-même pour se sentir bien. L’essentiel est d’être en harmonie avec son corps et son esprit. Cela nécessite une certaine force de caractère de ne pas se plier aux normes des autres et de rechercher son propre équilibre. J’ai lu un livre intéressant qui allait dans ce sens “Ecoute ton corps et mange” de Louise Bourbeau. Je te le recommande :-) Belle journée. This is exactly how my journey to quitting sugar and most processed carbs went. I wish lots of light and love in your journey. On a personal level AND as a keto coach your story is all too familiar: I fell ill in 2013 after too many years of eating a standard western diet, drinking alcohol and sleep deprivation. Like you I cut out all sugar to begin with and within 6 months I had switched to a 100% ketogenic lifestyle. All my symptoms disappeared :-). It is now my profession: helping people start their own keto lifestyle. Everybody should decide for themselves what works best for them but I am convinced sugar really IS the enemy and most people would do much better eating low carb, moderate protein and high fat. I did not read all of the comments (far too many of them! ), but I did read far enough to see that some comments were very negative and critical (and nasty, in my opinion). I applaud Garance for her humility throughout her article. She shared something very personal from her life’s journey and it saddens me to think that some would attack her after reading what she shared. How often does one see such a humble, open-minded closing as hers, especially when talking about health/lifestyle? Many things written on those topics are written only from one perspective. Though she was sharing what has worked for her, and what she is learning about herself, Garance did not push a “cookie-cutter” formula for all of us; she respected our individuality. I’m copying and pasting her words here, because I think this message, which allows for our individuality, is a much-needed one today, and applies far beyond what we eat! So, thank you, Garance, for your sweet, non-judgmental spirit–a very refreshing thing to come across! “What is good for us, what isn’t good for us. In what quantity. At what time. En vivant à l’étranger, en Italie puis en Inde, je me suis éloignée des habitudes françaises “quoi pourtant on mange si bien en France”… Pas toujours à mon sens. Et j’ai ressenti que ça agaçait beaucoup mon entourage. Suite à l’Italie, j’ai appris à mangé beaucoup plus de légumes avec de bons assaisonnements quitte à avoir la main lourde sur l’huile d’olive, arrêter les frites qu’on retrouve en France trop souvent en accompagnement d’un plat au resto, le pain, la charcuterie et les chips. J’ai été choquée d’arriver ensuite en Inde et de voir que tous les français m’accueillaient pour l’apéro avec du pâté et du saucisson ! Autant dire que mon refus était perçu comme un refus de nationalité. Mais en effet, en me nourrissant différemment sans même faire attention, j’ai découvert que mon corps n’avait pas besoin de toute cette nourriture. Bien au contraire… Maintenant je n’ai fait plus de repas où j’exagères car je déteste cette sensation, cette lourdeur. Et en lisant ton article, j’ai bien envie de diminuer le chocolat et le café car il m’arrive d’avoir ce que tu décris comme petites crises d'”hypoglycémie” mais elles deviennent anecdotiques. Si tu as des liens à conseiller pour trouver des recettes et des conseils, ça serait super ! J’ai juste attendu plus longtemps…soigné mes angoisses, et un matin de juin 2017 j’ai tapé dans ma barre google “perdre mon ventre” . Un jeune trentenaire m’a expliqué qu’il fallait que j’arrête de manger mon petit dej. Ce que j’ai fait . J’ai perdu 13 kilos sans peine en trois mois. J’entrais tous les matins dans le royaume du sucre….désormais un café sans sucre et j’attends midi sans problème. Je déjeune de protéines, de légumes que je cuisine et de fromages. Je me bats encore avec le sucre (les gâteaux, le pain les féculents) …..mais quand même….je revis. Honestly? I feel pretty mixed about this post. I’m thrilled for you, Garance, that you’ve found something that you feel works for you. After all, each person is different, and you know yourself and your body best. But seriously, the downgrading of science and the consultation of doctors in this and other similar wellness posts around the web is depressing. It’s like we’ve collectively decided that googling our symptoms on WebMD and “trusting our intuition” is equal to discussing one’s health with a doctor. Not to mention that confirmation bias and placebo effects are very real. Like I said, I’m thrilled you’re feeling better and feel like you’ve found something that works for you. But I really worry that this trend in wellness blogs is a sad reflection of the increasingly low esteem with which we hold well-grounded science. Merci d’avoir partager ca avec nous Garance. je me trouve dans un situation similaire et j’apprecie beaucoup cette poste. En ce moment, je suis en train de boire un cafe vraiment sucre que je veux pas buvez mais je m’ai dire que je’en besoin. Vous m’avez inspirez de le jeter immediatement et d’essayer a faites attentions au signals donnes par mon corps. Merci et pardon moi pour tous les erreurs grammaticales. je suis toujours une etudiante. I gave up sugar in my coffee. It was a weird realisation. I stared at my cup and wondered my am i even putting sugar in this? It wasn’t much, 1 teaspoon, but it was automatic. You put sugar in coffee. I had put sugar in it since i started drinking coffee, and never questioned if i even need it. To which the answer is no I don’t. I drink it with milk and don’t need sweetness interrupting the aroma. I still indulge in a an overpriced caramel latte but that is for special occasions. It doesn’t makes sense to me why I didn’t realised to sooner, i drink a lot of tea. We always had tea when i was little, my mom made a liter or two per day, and we drank it unsweetened so i got used to that. It’s funny how we don’t analyze our habits, we just do them but i guess that’s why they are called habits. Thank you for the interesting article. Thank you so much for writing this Garance. I have had similar symptoms since I moved to Europe three months ago – where I have been eating a lot more sugar and carbs. The neck pains, the weight gain around the stomach, constant peeing, neck aches, the family history of diabetes. You listed everything I’ve been experiencing – and I have suspected that refined sugar is playing a big role. Your article has inspired me to finally make some changes in my diet. I would have pondered it for another year – but after reading this I think I’ll start… now. Hello, I read this column last week, December 18 or somewhere around there. It’s a week now and I still have your words in my head. Sugar is my drug. And has been all my overweight life. When you mentioned joint pain and tension, I could feel my body respond as if it was hearing your words. I’m thinking about your words everyday. Just thinking. When the thinking turns to action, I’ll let you know. Maybe this is the first action. Just to tell someone that sugar is my drug. Hello G, its been a week since I read this post and another week still that you wrote it. Sugar is my drug. I’ve been on it all my life. Not realizing the the tension and joint pain it causes could go away if I could walk away from sugar. I’m thinking about it. The thought of walking away is in my head every day now. The question is when will I? Thank you for your words, the echo of them in my head is helping. garance, i’m really interested in what docs you’ve been watching/ literature you’ve read on the health benefits of restricting sugar. i’m giving it a go myself and would like to arm myself with good information. merci! Chère Garance, beaucoup d’entre nous peuvent se reconnaître dans ce post. Oui manger trop de sucres, rapides ou même lents, de mauvaise qualité de surcroît, peut avoir des impacts très négatifs sur notre état de santé général. Je me permettrais d’ajouter un autre point : quand on dépasse la quarantaine, notre système digestif se met de plus à nous jouer de sales tours, et tolère particulièrement mal certains aliments, dont évidemment ceux qui sont trop sucrés ! Pour ma part, j’en veux à ma gynécologue de ne pas m’y avoir sensibilisée, j’aurais pu anticiper certains problèmes ! Bon courage pour la suite. Ce qui est important c’est de (re) trouver un équilibre alimentaire, qui laisse quand même une place au plaisir de manger et à la convivialité ! I have tried cutting out all sugars and for me it didn’t work, but I’ve found the best way for me is to really reduce the amount and choose the “healthiest” forms of sugar. I eat fruits and organic wholegrains, but desserts only from time to time, and usually a homemade cake made with a moderate quantity of brown sugar. At first it might seems hard, but there are many healthier sweets: smoothies, homemade ice-creams, fruit pies… And many cake recipes can be adjusted by replacing chocolate by pure cocoa powder and sweetened with bananas, pears or dates instead of sugar. I would not have been able to sustain a no sugar diet in the long run, but this “reduced sugar” diet feels effortless! Garance! Honnête et sans excuses. J’adore! Bravo! Moi aussi je réagis super mal à la caféine et au sucre. Les gens peuvent me traiter de ‘health freak’, mais franchement la seule relation qui compte c’est celle que j’ai avec moi. Je mange tout de même du bon fromage!! Do what works for you! C’est très difficile de se priver de manger des choses qu’on aime. Moi, je n’ai jamais réussi à faire un régime. Je n’avais jamais une bonne volonté. Mais, lorsque j’ai eu un diabète gestationnel au cours de ma grossesse, j’ai eu peur pour le bébé et pour moi aussi puisque le diabète est héréditaire dans ma famille…J’ai alors fait de mon mieux pour ne pas manger les sucreries, les pâtes et les aliments trop gras. Aujourd’hui, j’ai perdu du poids et je me porte bien. C’est difficile mais, ce n’est pas impossible ….. I have slowly been rearranging my diet and cutting sugar out of my life completely as I, too, found out I have a familial history of diabetes as well as insulin resistance! I panicked at first, but found myself doing nothing. Eventually I started drinking my tea without sugar and cooking my food more often than eating out. The frustrating part is living with family! It’s hard to build your diet around people who don’t experience the same issue (or prefer to ignore it). Though, a bite of chocolate doesn’t hurt every once in a while! – On a third day you’ll be able to strive your tomatoes.